The neutron is a special elementary particle in nuclear physics : it is easily absorbed in a nucleus because of its lack of electric charge: nucleon itself, it naturally interacts with other nucleons. The energy of the neutrons produced in reactors does not exceed 2 MeV . Two options are available to them: a simple "elastic" collision or the capture by a nucleus. Elastic collisions (called also elastic scatterings) are used to slow neutrons in moderators. Capture adds an extra neutron to a nucleus. The introduction of this neutron mingled with other nucleons generates an " excitation" within the nucleus. Generally the nucleus gets rid of this excitation by emitting a gamma ray: the capture is then called "radiative". Exceptionally, some large nuclei are split into several fragments: the fission. 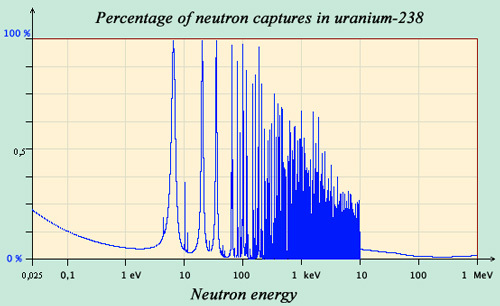 The curve of the percentages of neutrons capture in collisions with uranium-238 nuclei shows the presence of a "forest" of resonances below an energy of 10 keV. At a resonant energy, not only the nucleus seems to grow, but also the capture probability becomes large. These resonances are many, sometimes very close from each other. Between the resonances, the uranium nucleus becomes almost invisible to neutrons and the capture probability drops almost to 0. The variations of the neutron capture probability (called « cross section ») with energy are very large. One observes that the cross-section is generally the largest when the neutron is very slow. This increase in cross-captures at low energies is explained intuitively by the fact that a slow neutron has more time to interact by mingling with other nucleons of the nucleus than a fast neutron. In addition, a nucleus has states of specific energy, like a musical instrument that resonates at certain frequencies. If the energy of the neutron is such that the energy of the compound nucleus corresponds exactly to one of these energy levels, the nucleus comes into resonance and the capture probability becomes very large. After losing its excitation energy, the nucleus becomes an isotope of the initial nucleus with one more neutron. This isotope can itself be unstable. That is why the materials subjected to a neutron flux, such as the cooling pipes or the claddings coating the fuel, become radioactive. Radiative capture competes with fission. Neutrons captured by the nuclei present in the core of reactors are lost for the chain reaction. 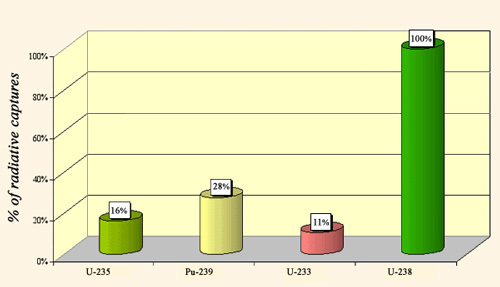 The figure shows that for the three main fissile nuclei (uranium-235 and 233, plutonium-239), radiative capture concerns only 10-28% of the captures, while for uranium-238 and all non-fissile nuclei radiative capture amounts to around 100%. Percentages are given for slow neutrons that favors fissions. Fast neutrons are able to fission nuclei known as non-fissile such as uranium-238 and actinides. Radioactive captures play multiple roles in reactors. Sometimes, one should avoid them, in order not to lose too much neutrons in the moderator or the fuel. Sometimes they are wanted, like those of uranium-238 in fast neutrons reactors in order to generate fissile plutonium-239. The radiative captures lead also to the formation of radioactive nuclei heavier than uranium, actinides, which are part of nuclear plant waste. Fission competes with radiative captures for a handful of nuclei. These radiative captures can be viewed as failed fission. The percentage of losses by radiative capture is an important feature of fissile nuclei.